Although some people are convinced the only way to add color to a room is by painting the walls, in fact, you have several options when it comes to adding color—and some can add texture, style, and character. If you’ve been thinking of bringing some color—and some more personality?—to your home, never fear. At Windo VanGo serving the greater Baltimore area, we have some great tips on how you can do it. Read on to learn more! These days, you can find just about anything in any color. Orange blenders, hot pink throw pillows, dark green plant pots. One choice many of our clients have made is to bring in shades of gray. Variations of gray are being used in flooring, walls, cabinets, bathroom tile, kitchen backsplash, countertops, window treatments, and even gray concrete kitchen sinks. Gray can be seen as trendy, fashionable, and even aspirational. It can convey seriousness and the message “I mean business.” When we see gray, we think timelessness, dependability, and quality. It’s best to use the shade of gray that resonates with you. If you want to go with a warmer tone, choose a yellow-based gray. If you want to go cooler, go with blue-based gray. Perfect for the bedroom, gray can pair with traditional, modern, cottage, or any style of bedroom retreat. Shades of gray from dark charcoal to light gray can appear in bedding, draperies, and window treatments. 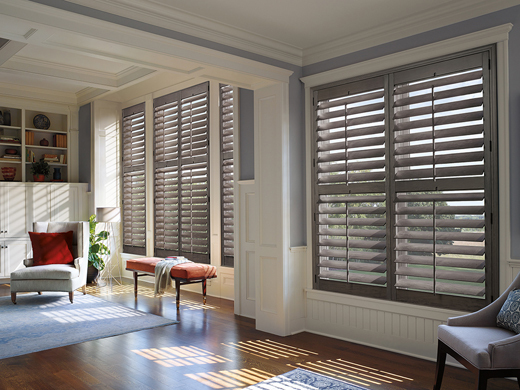 Check out the Hunter Douglas Salt and Pepper hardwood shutter called Heritance®, which is offered in six different finishing techniques that will bring texture and style to your room. 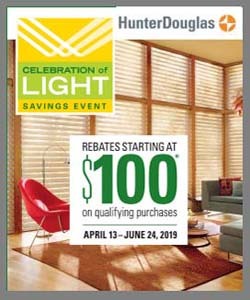 Also consider the Charred Wood colored vertical drape by Hunter Douglas called Provenance®. By customizing the woven reeds, grasses, and woods with a dark edge banding, you will create a captivating look for your window.